Suicide and comedy seem unlikely bedfellows, yet from Harold & Maude and Groundhog Day onwards the two have proved fruitful territory for comedy. Once you have a character who's given up on life you've got someone with a plausible reason for acting in an outrageous manner. Sure it's morbid, but my favourite comedy tends to be laced with sadness and desperation. The Skeleton Twins isn't exactly a comedy, but boy is it funny. You might have your doubts based on the opening, but bear with me. Here we see Milo (Bill Hader) writing a glib suicide note: ''To whom it may concern, see ya later.'' He then slices his wrists open. Meanwhile, on the other side of the country, his sister Maggie (Kristen Wiig) stares blankly at the bathroom mirror, holding a handful of pills. She's about to gobble them when her phone rings. She's informed that her brother, who she hasn't seen in ten years, has tried to kill himself. Putting her own suicide on hold, she travels to California to see him. Feeling a sense of filial loyalty she invites him to live with her and her husband Lance (Luke Wilson) in upstate New York. The stage is thus set for a knotty, mordant drama about inter-family relations, depression and the impossibility of completely healing trauma. I bet you're laughing already! Well, you will. The key to The Skeleton Twins is that while it always treats Milo and Maggie's problems with utmost sincerity, these characters are too smart to truly wallow in self-pity. Despite their initial differences, Milo is a depressed, gay failed actor living in California and Maggie is in apparent domestic bliss and trying for a baby, the two are immediately and obviously two sides of the same coin. In each other they see their their insecurities, paranoias and lack of confidence reflected - resulting in a fractious relationship that spins between familial intimacy and vicious arguments. A high water mark for happiness is a touchingly hilarious scene where the two get high on nitrous oxide; collapsing in an anoxic, befuddled daze in the corner as they gigglingly confess secrets to each other. It's funny, sad and kind of cute all at once. Scenes like this cement the perfectly balanced double act that Hader and Wiig have constructed. It's a pleasure to see two actors complementing each other's performances so well; mutually building their performances from the dramatic footholds the other provides. Of the two I preferred Wiig, though only by a hair. Her misery is tangible and we see rather than be told of her lack of control over her (rather unsympathetic) actions. She wears the consumed expression of someone suffering from intense guilt with no real way to alleviate it. Though she's obviously beautiful she emerges in the later traumatic scenes pale, drawn and looking as if she hasn't had a good nights sleep in weeks. The supporting cast are no slouch either. Ty Burrel as Rich, Milo's former highschool teacher and lover, comes at his role with a stone-faced permanence. His face is almost mask-like; neat, trimmed and with his thick-rimmed glasses almost Clark Kentish. Given that he's repressed his homosexuality we quickly read these stony-faced features convey a inner turmoil. But it's Luke Wilson's Lance who really, really shines in a supporting role. In a film of slightly haughty, effete intellectuals he's a bouncy, loveable and behaves rather like an excited labrador. Every time he bounded onto the frame I had to suppress a smile, his simple good nature and optimistic outlook a joy to watch. In Lance we get our example of what a purportedly 'normal' person should be behaving like and though our sympathies always lie with the screwed up siblings, his character demonstrates that conventional domestic bliss might not be such a bad thing after all. He makes me feel happy just looking at him. At times The Skeleton Twins feels like a headlong race towards death. Milo and Maggie seem to be caught in a kind of sibling rivalry as to who's more screwed up, with every other character helpless to stop the two destroying each other This means that though Maggie is theoretically supposed to be helping Milo recuperate, the two end up acting as each other's therapist. Taking life advice from a man who's just tried to kill himself could seem corny in the wrong hands, but there's a bedrock of love in the film that can't be poisoned by their various deep-seated issues. Very much an actor's film, The Skeleton Twins only slightly falls apart with some rather humdrum visuals and sound, and the occasional blob of melodrama. The ending in particular feels airlifted from another, far more heavyhanded, movie and there's the odd line here and there that feels overly didactic; 'this is the message of the film and by god you're going to know it'. Very much worth a watch, if only to see two extremely talented actors bouncing off each other. 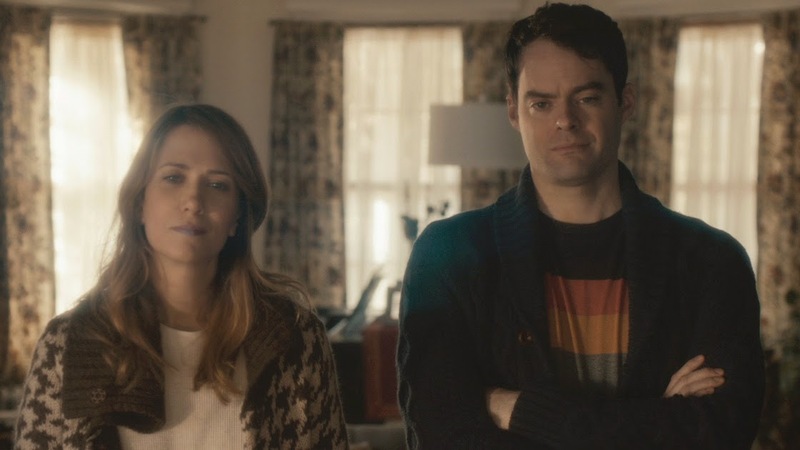 It's a cut above your average indie dramedy, but this is purely on the shoulders of Wiig and Hader, who elevate the material beyond cliche and all but force us to emotionally relate to Milo and Maggie, two wonderfully complex characters.